Traditional text messages are also not included. 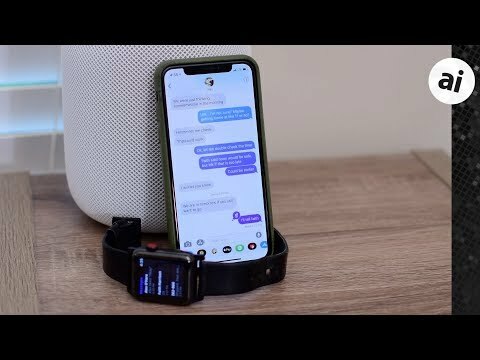 Any standard text, denoted by green in the Messages app, will not be uploaded to the cloud for synchronization -- but will still be sent to all of your devices sharing the same Apple ID. So, if you delete it in one location, it won't delete automatically on all devices. Deleting texts from the watch is cumbersome. I hope Apple see a need to correct this oversight. I don't have the option of enabling messages in my message preferences on my MacBook. There is no OS upgrade yet as far as I know. From a user perspective, If I enable Messages on iCloud, I would have to pay monthly fee for iCloud service immediately. Saving the iCloud costs in three years mean I can get a 128GB iPhone instead of a 64GB, or a 256GB iPhone instead of a 128GB. I am happy to stay with Messages on current “Apple cloud”. All messages are readily searchable on all of my devices includind iPhone, iPad, multiple Macs even without internet. I don’t have any synchronisation problem among devices. Why do I need to enable Messages on iCloud? It doesn’t make any sense to me. By not including SMS messages in the cloud, this means I still can’t set up a device as new and get my full messsge history. Another half-baked feature from Apple ☹️. I think the SMS feature is from your mobile phone carrier. Thus Apple is not involved in the SMS traffic. I don’t have any synchronisation problem among devices. Why do I need to enable Messages on iCloud? It doesn’t make any sense to me. A lot of people do have sync problems though... 3 for 3 in our family. Every one of my friends who uses Macs/iDevices has complained about it too. I think I'd count yourself lucky, for now. Yea, I was like... WHAT?!?! That somewhat defeats the point. Well, they can't obviously sync them back through the carrier, but why can't they sync them across iCloud to all the devices? It's displayed in Messages, so they have the data. What happens to old messages if you decide you no longer want to store messages in the cloud? So if everything is in the cloud does it save a local copy on the Mac so you can browse everything even when off line? I think the beauty of not using Cloud Messages is that I can delete the messages I don't want to see on my phone off my phone but always have them archived on my computer. With this system its all or nothing. Not sure if that is worth it. If you turn it off they will all download. Up until not too long ago, they were still selling 8GB devices (of which the OS and basic apps took up a good amount). I’m not sure the limitation on deleting SMS messages is accurate. Right now, all my SMS messages appear on all my devices. And with Messages in the Cloud turned on, when I delete SMS messages from android users or short code senders, it deletes from all my devices. Are you saying that you’re not having that kind of luck? I second this working – several of those pesky one-time codes came thru via SMS this afternoon; deleting the conversations on my Mac also deleted them on my iPhone and iPad. This was the main draw for me when setting up Messages in iCloud, but I hadn't considered the complexity of SMS/iMessage integration. Glad to see it works and I'm sure it took way more engineering that most of us would imagine. This is good to hear. I, frankly, would have been surprised if it wouldn't have worked, but I thought maybe that previous message knew it was a missing feature. Ive updated on my Mac and IOS devices and its not showing up in the preferences on any device. Maybe not yet for outside USA? Apparently apple stores messages in iCloud but I have done a clean install on my Mac and iPhone and now I'm trying to work out how to bring back a text message thread from last week? Is this possible? Something unrelated that I also find odd is that even though I have save for offline viewing on iOS and Mac for reading list, they are not available when I go offline. I don't think Apple would have the SMS data as it's just between your iPhone and the mobile phone carrier. Sure, Messages maybe the app that does SMS, but it's the carrier that has the data. I see no reason why Apple would be involved with SMS. Complain to your phone carrier. But, if it is displaying in Messages, Apple most likely has access to it. I really doubt Apple created some kind of encrypted tunnel inside Messages to just display the SMS messages with no access to them. SMS worked fine for me. I first turned iCloud Messages on on my phone, at which point it uploaded all SMS and iMessage it had to the cloud. Then next day (when 10.13.5 came out) I enabled it on my Mac, and the SMS came down from the cloud to my Mac.